We are studying zooplankton community dynamics in Delaware Bay in both a seasonal and historical context. More information on this work is described below. But first, above is an example of a plankton sample imaged by ZooScan, one of the technologies we are using to make this study possible. Move the slider left and right to see a ZooScan image of a plankton sample (on left) and that same image after it has been processed by a computer, and all animals outlined. Continue reading on to learn more about our study, or click here to learn more about ZooScan and other zooplankton sampling technologies. In response to questions about the health of Delaware Bay and its fisheries in the mid-1900s, scientists at the University of Delaware conducted the DelZoop study between 1952 and 1954. 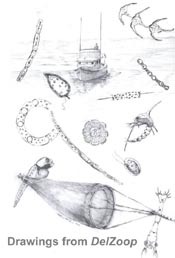 This was a comprehensive survey of Delaware Bay zooplankton from the freshwater near Philadelphia, PA to the ocean outside the mouth of the bay. Key to the success of this was Joanne Daiber, the first female marine scientist at the University of Delaware, and Eugene Cronin, the first director of the University of Delaware’s marine laboratory in Lewes. Sampling seasonally along with colleague Mac Hulburt, the team detailed the species in our waters as well as their abundances, and captured the changes in the zooplankton community from one season to the next. 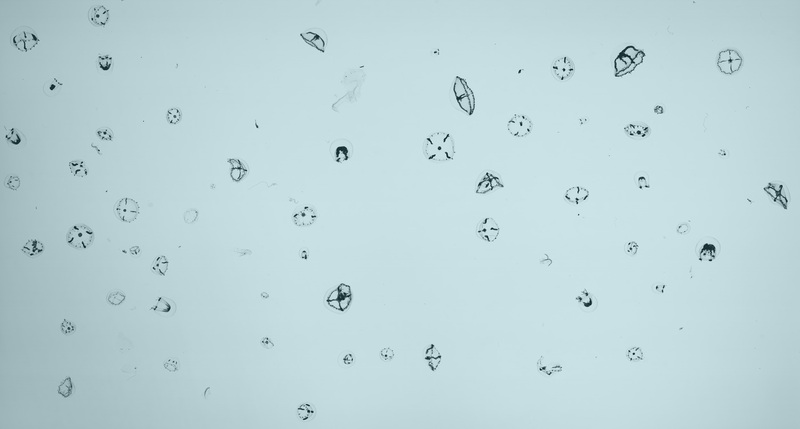 One of their major findings was the importance that salinity, controlled by seasonal patterns of precipitation, played in shaping when and where zooplankton species are found. Since then, the Delaware Bay has changed. Instances of low oxygen (hypoxia) that raised initial concern about the health of the bay’s fisheries have decreased, while international shipping to large ports in the upper part of the estuary have dramatically risen as the global economy grows, increasing our risk of invasive species entering through ballast water. Even with these changes, there has not been a comprehensive survey of Delaware Bay zooplankton since 1954 to detail the community and monitor for any changes. In 2014, we began our project -- DelZoop II -- to sample at the same locations as the 1950s DelZoop study. We have research cruises on a seasonal basis to not only understand the changes in zooplankton from one season to the next, but to investigate the changes that may have occurred since the 1950s with a changing bay. 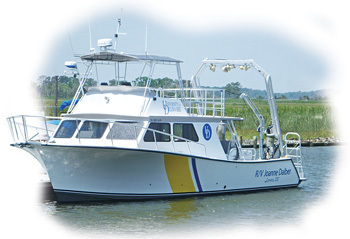 Using the aptly named R/V Joanne Daiber, University of Delaware’s coastal research vessel, we deploy nets to collect zooplankton at each station, much like the what Joanne Daiber did herself in the 1950s. However, we use updated technology, such as the ZooScan, to help us process samples more efficiently. So far, our results suggest that the dominant species and overall amount of zooplankton in Delaware Bay has not changes since the 1950s. But, when and where particular species are located has changed with improved water quality in the upper bay. In 2016, we added several new dimensions to this project. We are now examining whether zooplankton provide a biological indicator of climate change in Delaware Bay. We are doing this by making measurements of zooplankton body size across the seasons and comparing them to similar measurements made in the 1930s and 1950s. Warmer water over this time period is expected to result in small zooplankton. We also started quantifying microplastics in our plankton samples, and have begun a study looking at the effects of tidal flow on zooplankton in the St. Jones River (Kent County, Delaware), which is part of the Delaware National Estuarine Research Reserve. Our work has been featured in UDaily, WDDE radio, The Coast Press, The News Journal (with graduate student Adam Wickline on the front page! ), and WHYY First, as well as the 2016 Sea Grant Week conference (poster presentation) in Newport, Rhode Island.